You can rely on the largest group of board certified podiatric physicians in central Iowa. Patients benefit from the collective experience of our team working in a University setting as well as from an individual physician’s specific area of expertise. We pride ourselves on patient satisfaction. In a recent nationally recognized patient satisfaction survey, DMU Foot and Ankle ranked in the top 10% of all Iowa sites in the areas of: Overall Experience, Convenience of Office Hours, Ease of Scheduling Appointments, Patient Safety and Privacy, and Likelihood of Recommending Practice. 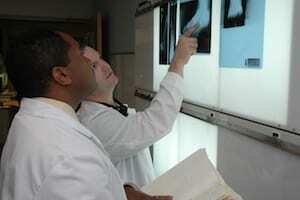 DMU Foot and Ankle is the clinical extension of Des Moines University’s College of Podiatric Medicine and Surgery. In addition to the care we provide to our patients, our physicians are preparing tomorrow’s podiatric physicians using the latest medical and surgical technology. Monday - Thursday from 8 a.m. to 5 p.m.
Dr. John Bennett and his staff are wonderful, and treat me and my family with caring and respect. I always enjoy visiting and seeing them. Dr. Frush and the student both involved me fully in discussing my concerns and the possibilities of solving the problem in the least restrictive ways. The Doctor was very helpful and gave me some good ideas for my care. I received excellent care from the entire team. I was impressed with the experience at the clinic. No waiting, pleasant staff, and I felt in the hands of professionals. A quick note of thanks for seeing me and diagnosing the problems I have with my feet. After 5+ years it seems I have found an answer to my situation... I appreciate the time you took with me and the students explaining what you think of my situation. You were pleasant and a true professional. I wanted to take the time to thank you for the incredible care we received this morning in the Foot and Ankle Clinic. I had to take my 15 year old son in for an infected toe and I was blown away by the time that was taken to listen to him, engage in conversation with him and not make us feel rushed. I know that kept him calm as well. As we left, he spoke highly of the student and Dr. Bennett and how they weren't rushed and listened to him. As a parent, it was welcomed. Thank you for taking the time this morning, we both appreciated it. The visit was very organized and the staff was very pleasant. It was a nice reception area, also. I had a very good experience, thank you! I have always found the clinic providers and support staff to be excellent, including the students who participate under the guidance of the providers. I really appreciated how well I was listened to, and how easy they made it to understand my options.